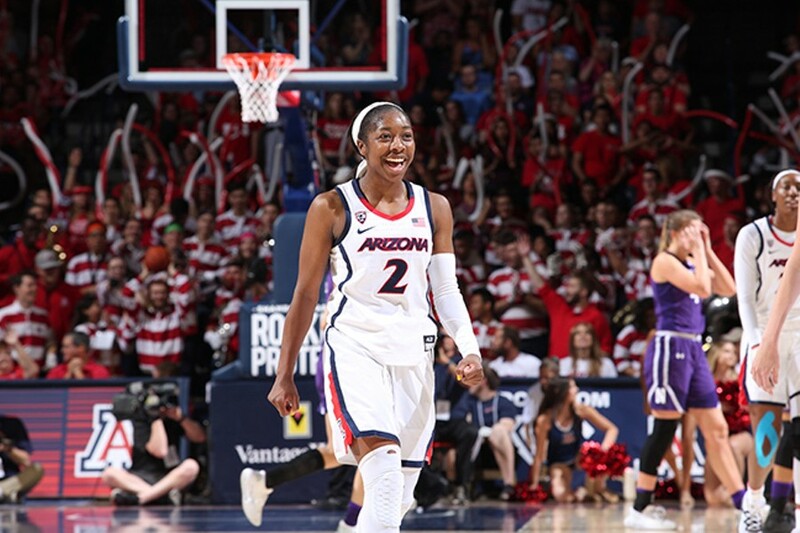 Rebecca Sasnett/Arizona Athletics Aari McDonald averaged 23.2 points, 7.3 assists and 7.3 rebounds in the WNIT Tournament. Streams of red and blue confetti rained onto the court of the McKale Center as a heap of Arizona Wildcats let out primal screams of jubilation Saturday afternoon. The joyous scene was the net result of six wins by the Arizona Wildcats' women's basketball team (24-13, 7-11) over the course of the 16-day Women's National Invitational Tournament. That final victory, which came the afternoon of April 6 against the Wildcats of Northwestern University, capped off the school's second championship at the postseason event. The 56-42 win in the WNIT championship round featured a sellout crowd of 14,644—the first in program history. It was a victory that came on the heels of triumphs over the likes of Idaho State, Pacific, Idaho, Wyoming and Texas Christian University. It was a win that third-year coach Adia Barnes built her program to achieve, setting a high bar for a squad that returns all five of its starters next season. Barnes said this year's team, which was picked to finish 10th in the Pac-12 preseason media poll, has forever changed the narrative around women's basketball in Tucson. "I think everything happens for a reason, I think you're put in situations for a reason, there's always a bigger plan, so it's probably meant to be," Barnes said. "I mean, this is a pretty good story, it's a story I like, and I think it's magical." The majesty of the Wildcats' 24th and final win of the 2018-19 regular season included a wire-to-wire thumping of a Big 10 Conference power, with Barnes' squad leading for 36:58 out of 40 minutes during the championship game. Part of the majesty of Saturday's WNIT championship contest was the record-breaking crowd, which drew praise from both head coaches. Joe McKeown, who's coached at Northwestern since 2008, and in the women's game since 1986, expressed a sense of pride in how large and loud the crowd was in their postgame comments. "I've been in women's basketball a long time—I've been a head coach for 30-some years—and the crowd today was tremendous," McKeown said. "I think it was great for our players. Even though it was probably an advantage for Arizona, it was great for our players to play in that atmosphere." Redshirt sophomore guard Aari McDonald, who took home the WNIT MVP award thanks to averaging 23.2 points, 7.3 rebounds and 7.3 assists per game during the six-game event, said she's thrilled to take home the award. "It means a lot," she said. "I'm humble with my award and I know that I wouldn't have gotten that without my teammates... I give the credit to them. Without them, I wouldn't be the player I am or receive the award I just did." McDonald, who scored 19 points in the championship game, joined her teammates in a ceremonial net-cutting ceremony, snipping a piece of the thread to commemorate the occasion. She didn't hark back on the team's momentous victory for long, however, turning her attention to the future. "It's going to be scary next year, definitely," McDonald said. "We have a whole summer ahead of us to get better. And then with the incoming talent, we can build something special this year and hopefully make the NCAA Tournament and just make a run and make some noise." Noise was not hard to come by Saturday afternoon, with the crowd living and dying with each of the home side's makes and misses. Barnes, who played on the Arizona team that won the same event in 1996, believes her squad can pack McKale more next season, having sold mazny on the team's future prospects. "Today is the start for us," she said. "So I think this is just going to be an avalanche. Next year, they're going to be hungrier, they're going to want to make it to the (NCAA) Tournament." Saturday's triumph also showed Barnes how far her team's come since their run of hard-fought losses in Pac-12 play, and how close her team is to reaching the promised land of the NCAA Tournament. She's confident that McDonald, as well as freshman Cate Reese and senior Tee Tee Starks, will be the backbone of a conference title contender next season. She said that confidence stems from the highs of winning, as well as the heartbreaking lows of losing single-digit games to conference powers like UCLA, Oregon State, Cal and Stanford. A relative equilibrium is found at the season's end, leaving players and coaches to find that next level of success. Accomplishments like the WNIT championship wouldn't have been possible without those devastating defeats, according to Barnes, as the team's character was forged in the fire of conference play. "This is tremendous experience for Cate, for Aari, for Sam, for Dominique, for Tee Tee because next year they will be more of a more of a calming presence," Barnes said. "I think that if we wouldn't have gone through adversity at the end of the season, we wouldn't have been able to win this." McBryde, who transferred to Arizona from Purdue University in 2017, agreed with Barnes, touching on a motto that's become a rallying cry for the team this season. "We want to make the (NCAA) Tournament, we want to have key upsets next year," McBryde said. "So, I think just getting the freshman next year involved and getting them bought into the system will be great, and we're just ready for it."